Shade’s birth occurs the year before Nabokov’s April 23, 1899, birth. On page 13 of the Vintage paperback I got for Christmas, Kinbote refers to Canto Two as “your favorite”. I wonder what sort of reader he imagined. Pg. 15: Perhaps they will feature “the disheveled old poet’s jerky shuffle” on Dancing with the Stars. Thanks Tom for a terrific post. William Carlos Williams said he intended Paterson to have four parts, but he later added a fifth. "The calendar says I had known him only for a few months but there exist friendships which develop their own inner duration, their own eons of transparent time, independent of rotating, malicious music." -p.11 in my battered ppbk ed. from Lancer. The crazy "rotating" sound of amusement park music as background to Kinbote's Foreword? To quote Homer Simpson, "It works on so many levels!" 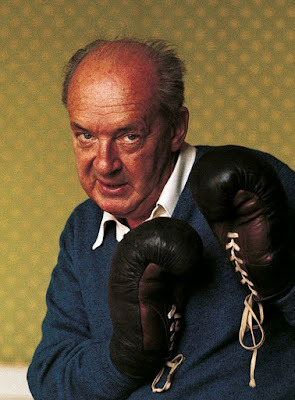 Wikipedia says Nabokov's birthday is April 22, 1899. Pretty close to the 23rd. I don't have another reference handy. Shade was born and died in the same month, just like RAW. Nabokov also died in July. I just finished yet another viewing of _Laura_ (1944 Preminger), and can't help but hear and see a lot of Waldo Lydecker in the Charles Kinbote persona, although Lydecker wasn't obviously homosexual or as "mad" as Kinbote seems. But Wittgenstein might say yea, there's a family resemblance. I love the idea of Preminger directing "Pale Fire". I can see the cop with the handheld baseball game investigating Shade's murder. Jumping right into Pale Fire with a head full of Grapefruit Bubble Hash was a pleasing experience(although,i did have to re-read a few paragraphs)...I feel like a dunce around you seasoned Nabokov folks but i am honored to be here and look forward to experiencing Nabokov's prose for the first time with you all. Onward! Shade's murder makes me think of John Lennon's murder and of the film "Chapter 27" about the killer's activities the day before killing John. I only watched part of the movie - it disturbed me. I received Pale Fire from Amazon yesterday after unsuccessfully looking for it at local new and used bookstores. Have not read Nabokov before I only had the chance to read about half of the Foreword yesterday so haven't reached the part about how Shade died. Synchronicities dog me. Found it interesting that Shade's death is mentioned on the first page, that he started the poem shortly before he died. The loud amusement park holds significance for me. Amusement parks are considered bardo spaces (i.e. spaces that convey the mood of death or the bardo). A few days after my father died, I was told by a psychic I trust that he had entered a carnival-like environment in his bardo trip, that he must have been thinking of some such memory when he crossed over. So this amusement park atmosphere mentioned right after Shade's death makes me think this novel will have a bardoesque aspect to it. This sentence from page 24 jumped out: "Actually, it turns out to be beautifully accurate when you once make the plunge and compel yourself to open your eyes in the limpid depths under its confused surface." I recently posted a blog about the philosophical images of the heights, depths and the surface. I always learn something when I read Oz Fritz. I did not know that amusement parks are considered bardo spaces. When Oz reads John Shade's poem, he'll discover that it's all about death. Amusement parks loom large in my life. I work for a newspaper in Sandusky, which is the home of a prominent amusement park, Cedar Point. Is this "make the plunge" comment of Kinbote's a knowing reference to Shade's daughter's fate or just an unfortunate turn of phrase? The reference to Marat in line 894 made me think of Bob Wilson's essay "Thirteen Choruses for the Divine Marquis" in Coincidance. Line 981 calls July 22, 1959 tomorrow - almost of July 23. Started 'Pale Fire' last night. Read the whole Foreword today. I've read most of Nabokov's short stories (in an irresistible omnibus collection), thumbed through Boyd’s biography and VN’s letters, and last year read 'The Defense’—now excited to crack open this new puzzle. The Foreword struck me as neat, clever prose portraying Kinbote as an alarmingly obsessive, snooty, highly intellectual creep. I felt immediately drawn into the detective story developed by the little clues Kinbote drops about Shade’s death and his poem. - the detailed description of Shade’s composing the poem on index cards. Enjoyed this because Nabokov wrote his works on index cards. The whole thing felt very metafictional, picturing VN writing those very words on index cards. - Kinbote comes across as a lunatic. His conflicts with fellow Shadeans (accusing them of “fake news” on the second page), his snooty view of his colleagues, the degrees of his obsession with Shade, confronted as “a remarkably disagreeable person,” and the bizarre bit about his basement recreation on double table-tennis tables—it all paints an amusing yet disturbing portrait. I was kind of mesmerized by VN’s authorship of all this through a first-person, overwrought Foreword. - Kinbote’s recommended approach to reading the poem & commentary was funny because on the one hand he is clearly whacky and overobsessed while on the other this could be Nabokov giving clues on how best to approach his book. I fell on the side of the former.